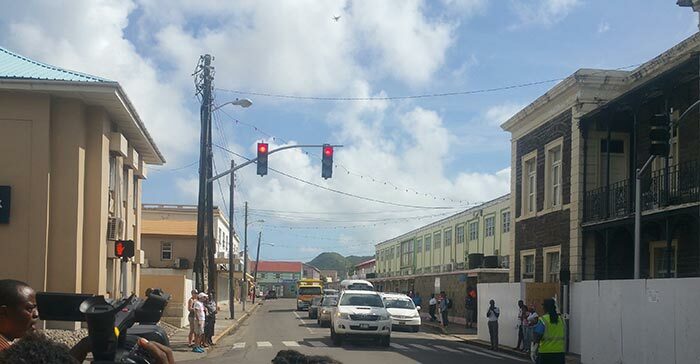 The traffic lights mounted in three busy locations in Basseterre have been given their first test since the installation of the missing control cabinets that delayed the commissioning in December. Cromwell Williams Director of Public Works told media representatives following an operation Wednesday to test the traffic that everything went as expected. “We were testing the lights this morning and everything seems to be working as expected, but as far as I am aware no time has been set for the commissioning will be in the public domain soon from the appropriate ministry,” he said. Williams confirmed that the missing control cabinets has since been installed and explained the critical role they play in the functionality of the lights. “These are the brains of the operation. There are cables running underground from the cabinets to the lights and those are the computers that control the lights,” he said. He however explained that the amendment to the regulations doesn’t require going to Parliament as it is just regulations that the minister signs, gazettes and comes into law. Rajib Subaran of ADB consultant the firm contracted to install the traffic lights explained the purpose behind the testing operation. “Right now we are just testing the lights and connections. The system has been programmed and we ran cycles to see if the programme and things have gone through. Everything is operational it was not done with the traffic itself, but it was done to see if the lights are functioning. Eventually when the lights are commissioned they will run with the traffic,” Subaran said. He also explained that local individuals are set to undergo training to learn how to operate the system. The current traffic lights mounted around Basseterre are only phase one of the project which cost an estimated USD$572,000. They are mounted on Fort Street, Cayon Street, Victoria Road, the Bay Road, as well as Wellington Road and East Independence Square Street. Phase two of the project will look at installing lights at upper Wellington Road, Sandown Road and the upper Bay Road.